In today’s world an Infrastructure Demand Response (iDR) approach to data center capacity management of application workloads and physical infrastructure is key to cost and risk management. “Demand Response” has been used for decades in the power industry to manage just-in-time power resources to fulfill demand. This approach in the power industry is analogous to the data center industry. 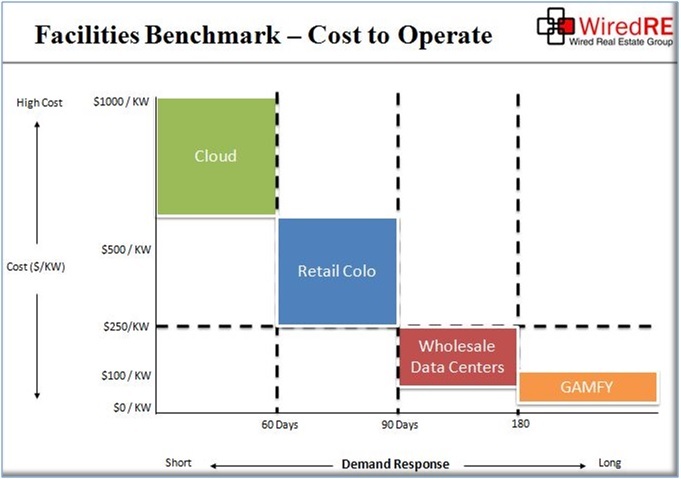 The following chart illustrates the relative cost in $/kw and time-to-market for the data center infrastructure stack, from hyper-scale build-to-suit to Cloud solutions. The $/kw prices depicted are representative of average market costs and can be highly variable dependent on many factors. GAMFY = Google, Apple, Microsoft, Facebook, and Yahoo, or similar companies. It’s a reference to large internet companies that build hyper-scale data centers for their own use, which provides them the flexibility to architect infrastructure solutions the other 99% generally can’t afford. Hence the low cost to operate but typically lengthy time to market. These companies all use various types of colocation as well. At the other end of the scale is Cloud solutions. Very expensive in comparison to Retail Colo and Wholesale Data Centers, but very quick to market. While many are encouraging a complete move to the cloud, most organizations with a reasonable amount of data center infrastructure would be making a economic mistake by doing so. For most organizations there is a mix of application workloads with variable capacity requirements. Some workloads may consume compute resources in a static and predictable way and represent the “base load”. Other workloads will be highly dynamic and therefore peak and valley in terms of resource consumption, perhaps seasonal or event driven spikes. It is these dynamic workloads that beg for on-demand or just-in-time infrastructure. To scale a Wholesale or Retail Data Center footprint to accommodate workloads with highly variable resource consumption is to watch valuable and expensive data center infrastructure sit idle. The greatest waste of capital and resources in the data center industry is over-specifying and over-provisioning of infrastructure leading to under-utilization. Managing this risk requires a thoughtful approach to iDR to achieve optimal economics and response to workload demands. This article is from the WiredRE Data Center Research and Advisory Practice. The practice focuses on data center planning and strategy, data center buy-side advisory, market and asset assessments, supply/demand and pricing dynamics. For more information contact WiredRE at (info at wiredre dot com).